You can now convert virtually any electronic device into a smart machine with this new device. Today it seems like everything is a smart device. There are now apps for virtually any appliance you can think of, however leveraging the technologies often requires purchasing entirely new hardware. A new startup is looking to change that however with a device called Kancy. Kancy is a smart switch that gives users remote control over every electrical device in the home. Lighting, stereo sets, coffee machines, water heaters, and air conditioners are just a few of the devices that can be made smarter with the device. Kancy comes in a few different versions for different tasks. There’s an on/off switch, a dimmer that enables users to set the mood remotely, a servo, and a standard plug. All these devices can be programmed using a timer scheme, or with if-then logic (i.e. when something happens, an action is performed). For budget conscious users who care about utility usage, there’s built-in electricity monitoring support with ongoing logging support. Users can also monitor and see which devices are being used in real-time. 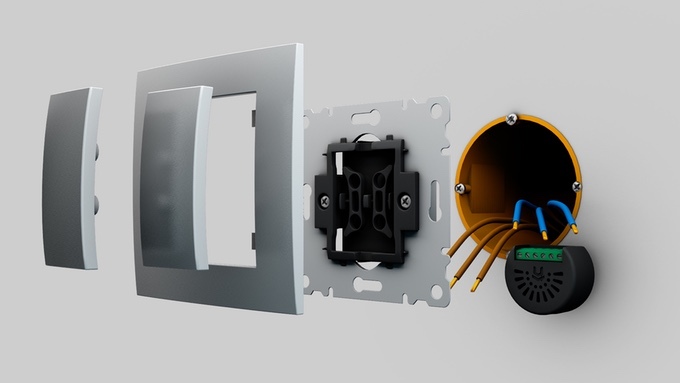 To use the device, users only have to attach the device to any wall outlet or socket. From there users can control the device either manually or via the companion mobile app. Kancy doesn’t require any hubs or controllers. It relies on existing Wi-Fi connections throughout the home. The app is designed to work with WeMo, IFTT, Phillips Hue, Facebook, Amazon Alexa, Twitter, Google Calendar, Gmail, and a handful of other web applications. Adding a device is fairly straightforward. Users download the Kancy app and register as a new user to organize their spaces. The user then connects the Kancy switches to the application. If desired, users can invite family members and other authorized users to control all or select appliances. To ensure users are responsible, Kancy offers the ability to log device activity so users can easily see who used a device along with the time it was used. Owners also can receive notifications as to whether a device is active or online. Kancy is designed to work with a variety of electrical systems such as those in European, American, Asian, African, and Australian areas. The device is 44.71mm x 37.82mm x 22.00mm in size. It comes with two control ports, two output ports, along with a neutral and line port. So far the makers of Kancy have raised over $18,000 via crowdfunding, with an estimated shipping date of December 2017. Pricing for the device starts at approximately $59, and the retail pricing is $90. All of the features of the app that goes along with this will sell this thing easily. Don’t get me wrong, the feature that allows it to work with any electrical outlet from around the world is a nice feature. I just do not think all countries are into things like this. It might be smart and also work with the big IoT platforms out there, but the price is out of hand. Does the company expect the normal consumer to buy more than one of these? In my opinion, if I cannot set up most of my plugs with this, I am not going to do just one. I really like that companies are on the uptick when it comes to products like this, but why cant they be easier to install? Of course, this does not look like that big of a deal to do, but why cant it be easier?